Paesanos 1604 is the Cosniac empire’s most ambitious restaurant --- take advantage of the creativity. 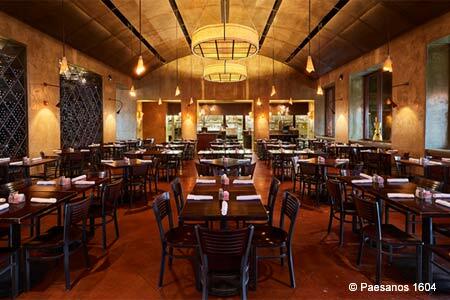 : Joe Cosniac has taken his longtime Paesanos formula and pitched much of it for this venture in the Loop 1604 corridor. We accordingly suggest you sidestep the “classics from over 40 years” in favor of more contemporary fare issued from the open kitchen. This is one of the few places we’d advise having the “giant” calamari as an appetizer; consider the starters of ricotta cheese gnudi with chunky tomato, and an ahi tartare with tapenade, too. Diners in garb from scrubs to shorts may also partake of “short-smoked” salmon with a peppery vinaigrette, jalapeño pesto fazzoletti with Peroni Ranch pot roast, or shrimp-and-andouille ravioli with artichokes and Creole cream. Ask the wine steward for a companion bottle from a list that emphasizes Italy but doesn’t diss California. In benign weather, the patio, framed in massive limestone blocks and dominated by a rustic water feature, is a pleasant place to contemplate what remains of nature in this urbanized area of the city. Enjoy some escargots with parsley-pesto butter, a split of Champagne, and your favorite thou beside you in the waning wilderness.